We are Spl. 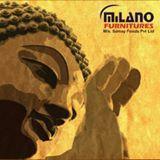 in Customised Wardrobes, Kids Furnitures Making & all other furniture customisation..
Milano Furnitures conducts classes in Commercial Interior Designers. It is located in Kavi Nagar, Ghaziabad. It takes Regular Classes- at the Institute.